The commercial paper market volumes are continuing to drop. The decrease in paper outstanding has in fact accelerated. A large portion of the change is coming from the Asset Backed Commercial Paper market (ABCP). This is the market that used to support the various types of ABS financing, including the sub-prime markets. In fact when a sub-prime borrower asks where the funds for her mortgage came from, a big chunk of that money came from ABCP investors. ABCP funded the senior tranche of the pool of mortgages bought from the originators. 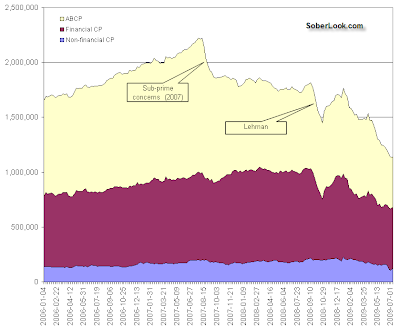 ABCP investors were generally money market funds. The ABCP market size took it's first hit in 2007 when investors got uneasy about the collateral. What remained after 07 was ABCP sponsored by banks, who in many cases were (or started) providing full credit support to the CP programs. Non-bank supported programs such as SIVs had to be unwound (liquidated). The problem with commercial paper in general is that every week, month, or quarter (mostly every day during the crisis) some paper matures. The borrower has to borrow again, i.e. roll the paper. Until recently we've had decades of rolling commercial paper with practically no issues. If it was rated by the rating agencies, it could be refinanced. 2007 changed all that, and banks could no longer rely on the market to be there for them. The banks are now reducing ABCP conduits (the off-balance-sheet entities that issue bank supported paper) and are using other, more stable forms of funding. Whether it's the FDIC guaranteed notes, longer term bonds, or the interbank funding, these sources are replacing commercial paper. Some of the financing is accomplished via TALF, which was specifically designed to replace the lost ABCP. The type of ABCP programs that remain are now dominated by "multi-seller" bank supported financing. These programs involve multiple originators of credit card or auto loans tapping the commercial paper markets. The SIVs and the securities arbitrage programs are disappearing (see chart). The overall decline in the commercial paper markets (to nearly half the peak levels) is another sign that the recovery will be extremely bumpy, and the GDP growth is unlikely to return to pre-recession levels. The shrinking ABCP markets powered a great deal of the consumer spending that contributed to that growth.